PES is proud to be an authorized dealer of Project KickStart project planning and management software. Project KickStart is a stand-alone program for brainstorming, planning and scheduling projects. It’s the only project management application that focuses on developing a project plan prior to scheduling. Over 150,000 users in the computer/electronics, banking, medical, education, consulting, small office/home office, small manufacturing and construction marketplace currently use Project KickStart for planning and scheduling. The Project KickStart 8-step planning process focuses your attention on the structure of the project, the goals, resources, risks and strategic issues critical to your project's success. You'll drag and drop hints from Libraries of Goals, Phases and Obstacles and get tips along the way from a helpful (and knowledgeable) "Advisor". Your plan is ready in 30 minutes! 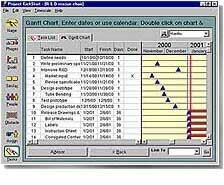 For scheduling and tracking larger projects, Project KickStart includes links to Microsoft Project, SureTrak, Fast Track Schedule, Milestones and Project Scheduler. For those who want to communicate their strategic plan to others, it has links to Word, Excel, Outlook, PowerPoint, MindManager and ACT! How Project KickStart Works - Review each of the 8 planning steps. Take A Guided Tour - Click through each planning step. Rave Reviews! - See what the press has to say. Project KickStart Training Webinars - You can listen to a Webinar to learn about the features of Project KickStart. Templates - Swap useful project, phase, and task templates/libraries with other users. ©2003 - 2011 PES, Inc. All Rights Reserved.